Prior to the introduction of the Aerobelt conveyor system, the alumina was blown using a pneumatic system consisting of airslides and a lean phase to the top of the storage silos from the calciners located at ground level. The disadvantages of this method of transportation were the high-power requirements to ‘blow’ the alumina to these elevations at these tonnages, and the ongoing wear to the lean phase system. 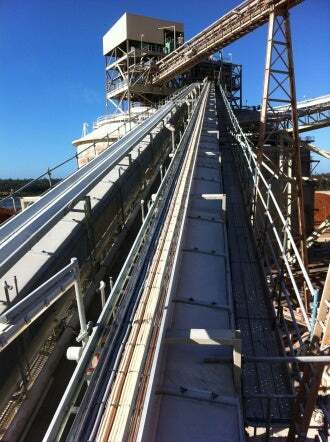 Worsley Alumina had already installed an Aerobelt conveyor onsite in 2002, for 150t an hour of alumina hydrate, so had operational experience of the conveying system and the Aerobelt conveyor had worked as designed with no issues. Worsley Alumina issued a tender to design and supply a suitable conveyor to have capacities of 600t to 1,200t an hour for a dual conveying system up to the shipping silo and 600t an hour to the storage silo. The decision was made to install three 1,000mm-wide Aerobelt conveyors, with one operating and one standby to fill the shipping silo. Justification for the selection of the Aerobelt conveyors were the capital costs for purchasing the equipment was A$1.6m and the saving per annum was A$1.1m. Prior to proceeding with the manufacture of the conveyors, Aerobelt recommended an inclination test to be carried out at Wollongong University to establish the ability of the Aerobelt conveyors to convey this material with high fluidity characteristics up a conveyor at 14˚ or more. Aerobelt had previously supplied three conveyors to Wollongong University to be used for design work on chutes and material trajectory. These conveyors were in a closed circuit and the inclination could be changed and the conveyor speeds could go up as high as 7m/s. Worsley Alumina engaged the university to carry out these inclination tests with alumina and witnessed the tests. Results were encouraging as inclinations angles were in excess of 20˚, the design angle only required 14˚ so the test confirmed the lower inclination should not be a problem. In practice, the alumina easily went up the incline and the conveyors all run at 2.4m/s, and was required to obtain the design tonnage with a zero material surcharge angle. A stainless steel trough skin was incorporated into the designs to resist the abrasiveness of the alumina and a Super Heatmaster nitrile belt was selected to manage the high product temperature. The lower-power demand on the new Aerobelt conveyors saved Worsley Alumina significant power and running costs, and were a key factor in selecting the Aerobelt system for this application. Two identical conveyors were installed side by side to create redundancy in this critical stage of the refining process. This provided 100% availability to fill the shipping silo. Image: Aerobelt installation for Worsley Alumina. Photo: courtesy of Aerobelt.